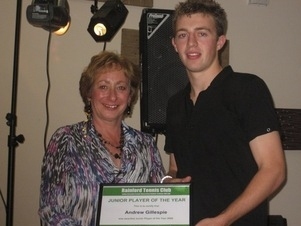 Andrew Gillespie has won the 2009 Junior Player of the Year award at Rainford Tennis Club following an impressive season on-court. Andrew won both the Boys Singles and Boys Doubles in the 2009 Rainford Tennis Club Tournament. He reached the final of the Men’s Doubles and only lost in the Men’s Singles to the eventual champion, John Machin. Andrew, who was also a regular for both men’s teams throughout the year, is pictured receiving his award from Club Chairperson, Helen Bligh, at the End of Season Party.